Commodore 64 Power Supply 902503-02, part 1. Commodore 64 Power Supply magic. “Pi1541” in 30min with (almost) no soldering. This was the dilemma I had one evening after repairing my newly acquired Commodore 64 machine – yes I will write a blog entry about it and link it here later. I really wanted to load a game and test the famous SID chip for it’s sound quality. So off to Google looking for quick solution. There are plenty of those floating around, most are semi-commercial, and pretty complicated and/or expensive, not something you can implement “tonight”. Than I came across the Pi1541 by Steve White. According to his post “Pi1541 is a real-time, cycle exact, Commodore 1541 disk drive emulator that can run on a Raspberry Pi 3B (or 3B+). The software is free and I have endeavored to make the hardware as simple and inexpensive as possible“. Wow, amazing work Steve! Plus he released it all to public for free, including schematic diagram of the “cable” and the source code of his software. 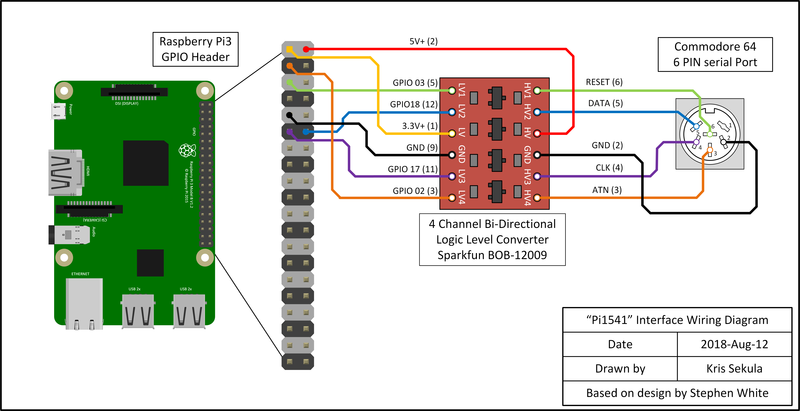 Yep, that’s it, one component – the 4 channel logic level converter, Steve suggests the Sparkfun part number, but places like eBay, Amazon, Banggood are full of alternatives. All you need is one based on MOS-FET transistors (you will see 4 of the 3 legged tiny transistors on the board) and you’re good to go. If you want to know what the logic converter does, it’s simple: you can connect to each other 4 digital lines of signals that are not compatible from the logic level point of view – the raspberry pi uses 0V/3.3V voltage to it’s logic “0” and “1” and the Commodore uses 0V/5V voltage. Each pair of HV1/LV1, HV2/LV2, HV3/LV3, HV4/LV4 handles one line, you can imagine that for each pair HV1 pin and the LV1 are “connected” to each other, so if we send a 3.3V “signal” into LV1, it will come out of HV1 as 5V “signal” (note: this conversion works in both directions). The remaining connections are related to power, so you feed “ground” to the GND pins (note: GND pin on the LV side is directly connected to GND on the HV side), you feed the low supply voltage to “LV” pin and the high supply voltage to “HV” pin. “But you promised no soldering”, okay…. First strip a wire about 1cm (0.4inch) and twist it. Option B. Since raspberry pi comes with pin headers soldered in already you have no choice you need to “source” the raspberry pi side connectors from somewhere – a good source would be and old computer case that has cables for DISK LED, POWER LED, RESET, BUZZER etc. This will give you the “plug” on the raspberry pi side, on the logic level converter side use the “twist” method mentioned above. Wire everything as per the simplified diagram. Now the only other thing left is to prepare the SD card. The first file in the 1541 folder should the the “file browser” file compatible with your platform, in my case I’m using Commodore 64 so I only left the “fb64” file in that folder. This file needs to be the first file in that folder so that when you boot your Commdore and issue the famous <LOAD “*”,8> command the file browser will start and let you “browse” the content of your virtual 1541 disk. To keep the file first I added the Games folder and placed all my games files inside it. I wish parallel port/Dolphin Dos emulation would also be supported! Next Next post: Commodore 64 Power Supply magic.